Here Comes the Boom, the just-released inspirational romantic sports dramedy (got that?) asks audiences to believe two preposterous notions. 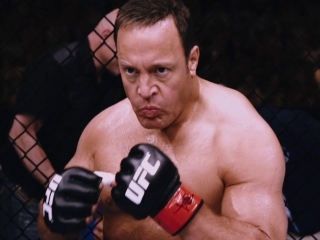 The first is that Kevin James, the portly fellow who amused us in Hitch and TV's King of Queens, could be competitive in mixed martial arts. The second is that Kevin James could have a chance with Salma Hayek. Does it succeed? Not quite, though it comes surprisingly close on both counts. First of all, James shed a lot of fat and put on a good deal of muscle, training for 14 months to play a biology teacher who takes up UFC fighting to save his friend's job (a music teacher played by Henry Winkler). Despite James' physical transformation, it's still tough to believe that he could compete against seasoned fighters, no matter what his determination level. The far-superior Warrior (one of 2011's very best movies) had a similar storyline; that film barely got away with it, and actor Joel Edgerton was in phenomenal shape. I must admit, however, that James surprised me with his athleticism here, both as a “fighter” and as a physical comedian. As for the romance, James and Hayek have far more sparks between them comedically than chemically. Their scenes together provide some of the film's funniest dialogue. Speaking of humor, Here Comes the Boom never quite decides whether it wants to be a comedy or an inspirational sports drama. It veers unevenly, back and forth, between the two. As a drama, it pales in comparison to the superior films it imitates (the aforementioned Warrior and the Rocky series, most obviously). Nearly every plot point is wholly predictable, as sports film cliches are trotted out one after the other. A school principal comes across as a one-note villain whose inevitable change of heart feels inauthentic and unearned. As a comedy, however, it fares much better. There are quite a few belly laughs here, including one moment that had me chuckling until my sides hurt and tears streamed down my cheeks. There's quite a few great one-liners, as well as some expertly-played physical comedy. The supporting characters are mostly solid; retired UFC Heavyweight Champion Bas Rutten is particularly likable in a warm and funny role. On top of that, it's PG and clean (see content overview below). Despite its flaws, Here Comes the Boom is a worthwhile excursion for those looking for inoffensive fun. It also portrays Christianity positively, which is always a nice bonus. 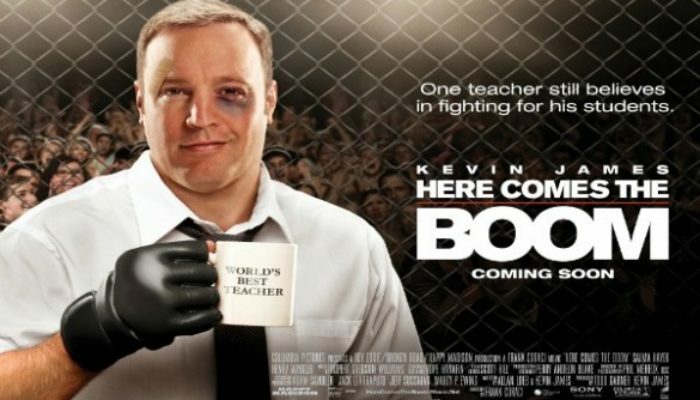 CONTENT OVERVIEW: Here Comes the Boom is rated PG. It has plentiful mixed martial arts fighting and a pair of mild obscenities. A woman reveals some cleavage in a tank top and men fight shirtless. MESSAGES TO DISCUSS: The story of Jacob wrestling a messenger of the Lord and earning a blessing, as referenced in the film, is found in Genesis 32: 24-30. With hard work, faith, and unity we can restore atrophied things, people, communities, and systems to their former lustre and beyond (Words of Mormon 1:16-18).